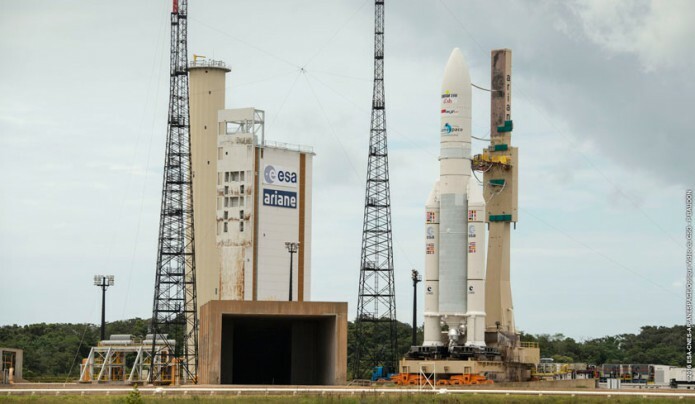 Unfavorable weather conditions over the Spaceport in French Guiana have resulted in a 24-hour delay for Arianespace’s Ariane 5 mission with EchoStar XVIII and BRIsat. Liftoff is now planned for Saturday, June 18, during a 1-hour, 10-minute launch window that opens at 5:30 p.m. local time in French Guiana. Ariane 5 and the two satellites remain in safe standby conditions. Designated Flight VA230 in Arianespace’s numbering system, this Ariane 5 mission will deploy the EchoStar XVIII and BRIsat telecommunications satellites into geostationary transfer orbit.